Cost effective, non-toxic, landfill friendly, natural ingredients, low-odor and user-friendly, BEAN-e-doo is ideal for removing vinyl, ceramic, acrylic, latex, and asbestos mastic from concrete floors. Please select options below to see price. SKU: BEAN. Categories: Envirosoy, Green Restoration Products. Tags: adhesive cleaner, adhesive removal, asbestos floor tiles, asbestos mastic, asbestos mastic removal, asbestos mastic remover, asbestos tile, bean a doo, bean e doo, BEAN-e-doo Mastic Remover, BEAN*e*doo, beanedoo mastic removal, beanedoo mastic remover, black mastic, black mastic removal, black mastic remover, carpet adhesive removal, carpet adhesive remover, carpet adhesive remover concrete, carpet glue, carpet glue removal, carpet glue remover, floor adhesive remover, franmar chemical, glue removal, how to remove mastic, mastic asbestos, mastic removal, mastic removal from concrete, mastic removal tool, mastic remover, mastic removers, mastic solvent, remove mastic, removing mastic, removing mastic from concrete, removing old mastic, removing tile mastic, tile adhesive remover. 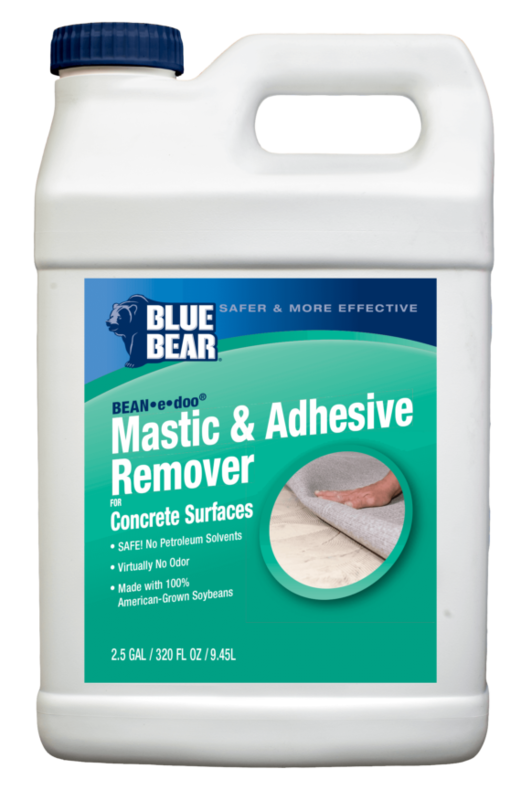 Please note: Franmar’s Bean-e-doo Mastic Remover is now called Blue Bear Bean-e-doo Mastic and Adhesive Remover for Concrete Surfaces. Cost effective, non-toxic, landfill friendly, natural ingredients, low-odor and user-friendly, Bean-e-doo® is ideal for removing vinyl, ceramic, acrylic, latex, and asbestos mastic from concrete floors. Bean-e-doo® is so easy and safe to use that it is the only product to pass both performance and environmental safety tests by the United States Postal Service for the removal of asbestos containing mastic. With a flash point over 400 degrees, less than 3% VOC’s, and being biodegradable, Bean-e-doo­­® can be used without complaint or disruption in public places or occupied dwellings. Users of Blue Bear’s Bean-e-doo® benefit from ingredients with no components that pose serious hazards. This benefit is amplified for janitors, maintenance staff, housekeepers, and others who must use cleaning chemicals in confined spaces on a daily basis. Importantly, a safer health profile especially benefits children who spend a large part of their day in indoor environments and can be particularly sensitive to the chemicals in some cleaning products. Also, the mild pH, low volatility, and low potential to catch fire enhance the safety profiles of these products. Uses: Indoor use only for removing asbestos, vinyl, acrylic and latex mastic over concrete sub floors. Not recommended for use on wood floors. Cleans up easy with water or degreaser such as Blue Bear Emerge™ Cleaner & Degreaser Concentrate. One gallon will generally cover between 100-200 SF. Most new users budget at 125 – 150 SF per gallon. Coverage and dwell time are influenced significantly by the condition and type of mastic, thickness of mastic, and porosity of concrete. In some conditions, Bean-e-doo® can take up to 24 hours to dissolve mastic completely, but will do it without the use of hazardous chemicals and grinding. 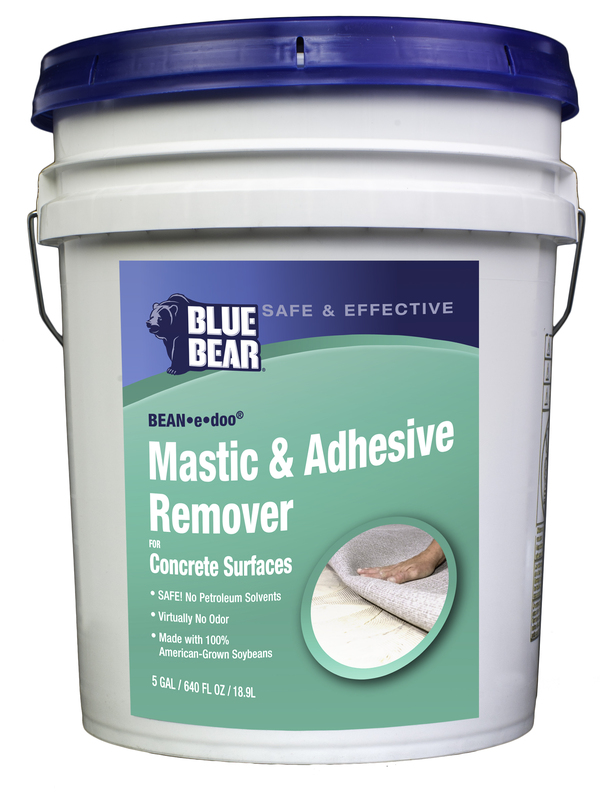 Bean•e•doo® will not dissolve mastic that has been mixed with hardeners. Do not use Bean-e-doo­­® for removal of mastic over wood floors. Bean-e-doo­­® may soak into the wood floor and cause discoloration. Using Bean•e•doo® also might slightly darken a concrete surface. DO NOT EXCEED the recommended coverage. Applying too much Bean-e-doo does not shorten removal time, but does contribute to impeding the complete removal of residue. Where there are wide cracks or seals, fill with a long handled scraper or squeegee commercial absorbent like diatomaceous clay (e.g. OilDry™), saw dust, or synthetic absorbent, before pouring Bean-e-doo® on the surface. Apply Bean-e-doo­­® until puddles well up on the surface. Use of a rotary cleaning machine for clean up is not recommended unless an area has been tested first. Testing surface for residue after floor has been mopped. See information on Clean Up. Please note: Bean•e•doo’s® advancements in mastic removal techniques sometimes requires a different approach to cleaning up. The condition of the concrete, its surface, age, even the environment are factors that contribute to the simplicity or complexity of mastic removal. The on-site user of Bean•e•doo® is in the best position to determine these factors. The tips offered below range from how to work with the simple (tight, undamaged, fairly non-porous) concrete to the more complex (porous to very porous, highly cracked, extremely absorbent). Where there are wide cracks or seals, fill with a commercial absorbent like diatomaceous clay (e.g. OilDry™), saw dust, or synthetic absorbent, before pouring Bean-e-doo® on the surface. Pour undiluted Bean-e-doo® directly on the mastic surface until the mastic surface is submerged completely. Use a long handled brush or broom to ensure Bean•e•doo® covers all the mastic trowel ridges and is close to the projected coverage rates. Allow Bean•e•doo® to dwell until mastic softens (generally 1 – 4 hours for asbestos mastic. Dwell time for vinyl and acrylic mastics is longer, in some cases 4– 24 hours.) Let the Bean-e-doo do the work for you! Important notes on removing asbestos mastic: Bean-e-doo® is an innovative formula made from 100% natural soy Beans that quickly coats any contaminated surface and fully contains the asbestos for efficient removal. The easy-to-work-with gel does not require workers to come in direct contact with the black asbestos mastic residue. Bean-e-doo® does the work so you have less exposure, easy clean up and less risk. Use a long handled scraper or squeegee to remove softened mastic and excess Bean•e•doo®. Generally, black mastic will dissolve into a liquid the consistency of very old engine oil, and can be scraped into a puddle. Fill the puddle with a commercial absorbent, and then shovel into a receptacle. Black Mastic contains asbestos and should be disposed of per local regulations. All other mastics tend to lift as more solid than liquid and can be scrapped into a pile that can be picked up with a shovel. After picking up the dissolved/lifted mastic, there will still be a slippery, film residue remaining. For best results cover floor with a commercial absorbent, sweep up and then follow with a mop rinse using a mixture of 4 oz Blue Bear Emerge™ Cleaner & Degreaser Concentrate and 1 gallon of water. In extreme cases, and/or for especially difficult floors, scrape up softened mastic, then pick up filmy residue with a steam vacuum. Test the surface for residues after the floor has been mopped by applying water to various small spots on the concrete. If water turns cloudy white, this indicates there is Bean•e•doo® on the surface. Re-mopping using a degreaser is recommended. Retest. Let surface dry before applying new mastic or coating. In all cases, care should be taken not to over saturate the floor by using too much water. Please Note: Use of rotary cleaning machines for cleanup are not recommended unless an area has been tested first. Blue Bear’s Bean-e-doo® is formulated with the environment and human health strongly in mind and use the following types of ingredients: biodegradable surfactants, with by-products that are less toxic than the parent compound; solvents that are not hazardous air pollutants and pose no threat to the earth’s ozone layer; and other components with a more positive environmental profile than in conventional cleaning products. Blue Bear Bean•e•doo® is available for shipment in the United States via FedEx Ground and international destinations. Rate 10 also if possible! I cannot say enough good things about bean-e-doo! I bought a house that the man had about 40 cats at all times. Litter boxes on shelves! The smell was so bad I was wreching 6 feet from the house and that was after a clean up company pulled all the carpet furniture etc out. We pulled all the old tile up and yup it still stunk! Black mastic. I rented a scraper…more work than progress. They suggested what looked like a big floor polisher but had a grinder pad on It. Again a lot of work little progress, not to mention all the money! I had people tell me about chemicals but all are dangerous to breath. Then I came across bean-e-doo! I spent a lot of time on the phone with Rae! She never got tired of my questions. So I ordered bean-e-doo and emerge. I was so impressed with it I ordered it in 5 gallon buckets! We had about 1800 square feet of floor to clean. It was amazing. Put it down, let it work, add kitty litter like oil absorb, squeegie up into buckets…then emerge water to clean. No cat smell!!! Couldnt believe it! I had already cut out drywall in areas but couldn’t get the smell off the floor. I can take u thru this house and u would never believe it was the same house…we actually put down emerge and hosed it off in the living room as we were on a slab emerge and beaneedo are awesome team. This companies customer service is awesome. I now know what to use on concrete floors to remove mastic and animal.smell!!! the easiest way. Also, it smelled nice not caustic ever. I got it on my hands a couple of times. No worries it didn’t burn! Pulling up mastic is a hard dirty job if u use the wrong product!! Don’t waste your time any other way it comes up just like the video shows! If I could give this product 10 stars I would. We were amazed with the result. Having purchased a home built in 1963 we removed the carpeting and discovered old asbestos tiles beneath. When we pulled them up we were met with an awful stench and the black mastic adhesive that was used to lay the tiles 52 years ago. I read about Bean-e-doo and we thought we’d give it a try. We applied it to 1/4 of the bedroom area with a broom, as recommended. We waited 1 hour but didn’t get the results we wanted so we waited an additional hour and were amazed at what we saw. We used a string mop and hot water in an old bucket to mop up the product and in no time at all…there was the concrete floor and no more smelly, black mastic adhesive. We’re looking forward to removing the rest of the adhesive in one room and finishing with a second room tomorrow. I’m so glad we found your product and now we’ll feel safe and odor free when we’re ready to lay our new flooring next week. I highly recommend this product and wish we were able to purchase it locally through a hardware store or Home Depot. There are many old homes in our area and I plan to spread the word about Bean-e-doo. Add a review Click here to cancel reply. © 2019 LogFinish.com. All Rights Reserved. Sign up for deal updates and wood care tips. Click here!